Easily take your ice cream party to the next level with these simple tricks. Your parties will be ahhh-mazing and you'll just smile as you think how easy it is with this free printable and these ice cream party tricks. This past weekend I threw an Ice Cream party for my girl friends. While it may have looked like I went crazy and out of my way for the fun, I'll let you in on a little secret--it really was super simple! And I admit, a lot of the best parties really are. It's just a matter of finding those key little details that take your party to the next level. 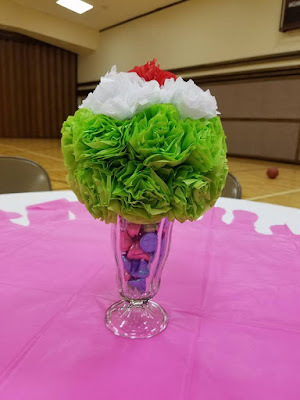 These flower sundaes were the perfect centerpiece and were so easy to make. I didn't want to invest in the money for real or fake flowers, so I made some out of tissue paper. Each table had a different color sundae and really made a pop of color and fun. 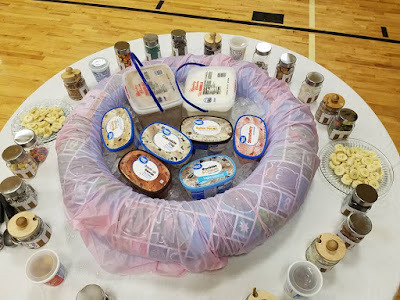 We used a circle table for the ice cream table and it worked out great. The ladies were able to attack the ice cream from all sides and could travel around looking for their favorite ice cream toppings. To keep the ice cream cold, I found a 3 foot wide baby pool and placed that in the center. Over the top, I placed a tablecloth and tucked that down around and under. Then, I opened 2 bags of ice in the center of the pool and filled that with ice cream. It kept the ice cream wonderfully, and when it was clean up time, we just pulled up the sides and dumped the ice in the sink. So easy! Around the outside of the ice cream, I placed jars filled with all the ice cream toppings I could think of. We had Oreos, Gummi Bears, M&M Pieces, Almond Pieces, Kit Kat Pieces, Sprinkles, Bananas, Strawberries, Sugar Crystals, Teddy Grahams, Reeses Pieces, Butterscotch Pieces, Chocolate Chips, Vanilla Chips, Mint Pieces, Toffee Pieces, Caramel Pieces, Pretzels, Marshmallows, Vanilla Wafers, Nutter Butters, Chocolate Syrup, Caramel Syrup, Strawberry Syrup, Hot Fudge, Whip Cream, Cherries, and Coconut. I think the jars and the cute ice cream topping labels really made the toppings stand out as a statement piece. The printable topping labels weren't hard to make. All I needed to do was print, cut, and tape them on to my jars. I'm giving you a copy of the base topping label so you can make your own ice cream party ahhh-mazing. Just save the picture below and add it to your favorite printable program and add your toppings to the label for a cute treat. 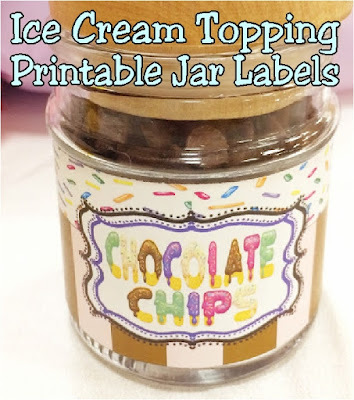 If you'd rather make the party even easier and cuter, you can purchase these ice cream topping labels pre-written from our printables store. 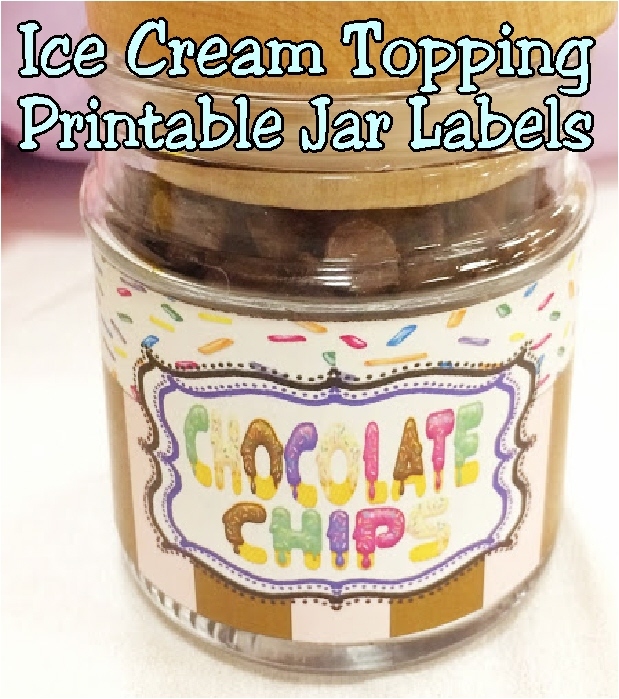 You'll get 20 labels with the toppings written in a super cute ice cream cone font, plus the blank label as below. Plus you can get them in JPG and in PDF so you can print it easily and be done quicker! 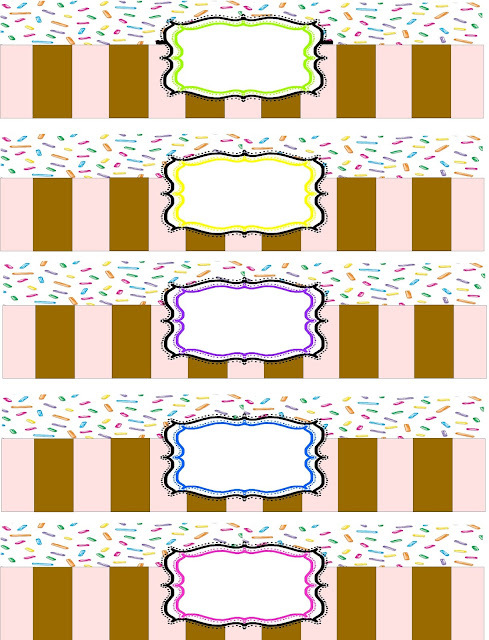 Find the printable topping labels here. Enjoy this printable and surprise your friends with how easy it is to take your ice cream party to the next level and your hosting skills to awesomeness! Get more fun free printables by subscribing to our email newsletter. You don't want to miss more ways to be the hostess with the mostess!